Today’s post is provided by Coaches Choice and was taken from an eBook entitled Coaching Volleyball: Offensive Fundamentals and Techniques edited by Kinda S Lenberg. The entire eBook may be found at the Coaches Choice Volleyball Coaching Library. Every summer, thousands of junior players attend volleyball camps around the country. Camps provide great opportunities for players to improve their skills and expose them to a wide range of coaches and techniques. As players reach higher levels, it becomes more important for them to understand why and how they do what they do. This chapter will explore some of the necessary thought processes and tactics that are essential for setting the offense. If point guards and quarterbacks are the playmakers of basketball and football, then the setters are the playmakers on the volleyball court. A setter must always think of ways to attack the weaknesses of the opponent; know how to counter-attack the defense of the opponent (especially the block); and find ways to give hitters one-on-one attacking opportunities. Early in the match, the setter should look to see if there is a weak blocker and how the blockers (especially the middle blocker) respond to different types of offense. In each rotation, there are three basic opportunities for the setter to look at the blockers: before, during, and after the play. The setter must recognize where the weakest blocker is and take advantage of any mismatches that may exist. For example, if the left-front hitter is a dominant hitter and the opponent’s right-front blocker is smaller or weak, the setter must run an offense that attempts to hold the middle blocker and allows the left-front hitter to hit one-on-one against the weak blocker. Against larger teams that may not have a weakness at the net, the setter must test the middle blocker to see how he responds to different types of sets. The best opportunity the setter has to see the blockers is during service reception. When receiving a serve, the setter can determine the starting position of each blocker and locate any weakness that may exist. The most obvious are the outside blockers. They will start either spread or bunched. “Spread” means that the outside blockers are starting in a position out near the antennas. If the outside blockers are spread, the setter should be able to set the quick hitter successfully by running the hitter into the gaps between the blockers. For example: 31, B1, FS (see Figures 13-1 and 13-2). entire net) to get a hitter one-on-one with the weak blocker, or can overload the weak blocker. Refer back to the previous scenario with a weak right-front blocker and a front left-side attacker. In this instance, the setter must attempt to draw the middle blocker away from the area of weakness. This goal may be achieved by establishing the quick hitter on a B1 or BS. The middle blocker must stay with the quick hitter and will have a difficult time blocking a fast set to the left-side hitter. Overloading a weak blocker means that the setter will run two or more hitters into the zone near the weakness. 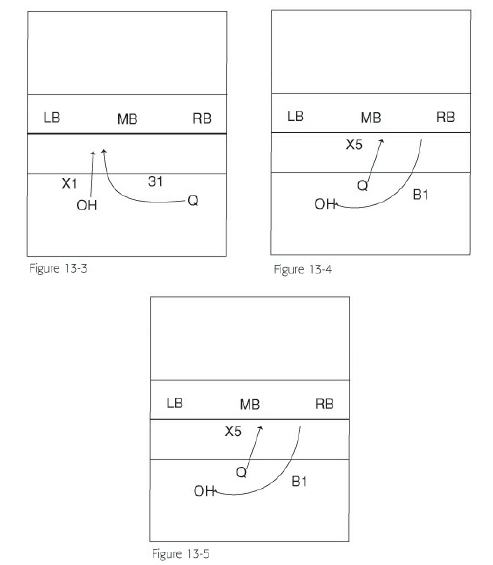 Figures 13-3, 13-4, and 13-5 show three different scenarios for overloading a very weak blocker. Watching the blockers during the play is the most difficult for a setter because he is concentrating on the ball. However, an experienced setter can perceive the movements of the blockers as the play develops, and a coach can help by watching the middle blocker from the sideline. Several possibilities may exist for blockers moving during the play. 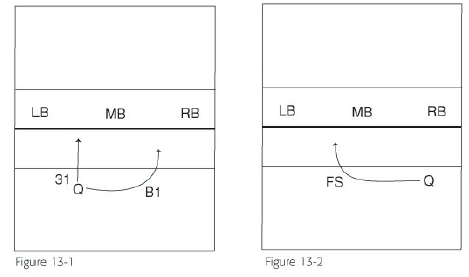 If the setter can perceive the middle blocker leaving early to make a move toward the outside, or a middle blocker who is fronting the quick hitter (making a move to stay in front of the quick hitter), reversing the flow (setting the direction opposite of the middle blocker’s movement) should prevent the middle blocker from establishing a well-formed block at the point of attack. 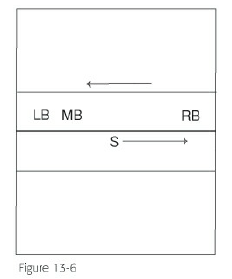 Figure 13-6 shows the middle blocker leaving early to the right. In this situation, the setter will set a fast back set to prevent the middle blocker from establishing a well-formed block against the right-side attacker. In Figure 13-7, the middle blocker is leaving early to the left, and the setter will set a fast set to the left-side attacker. Thus, the middle blocker will have to cover a very large distance to reach the point of attack. Often the left-side attacker will be in a one-on-one attacking situation. 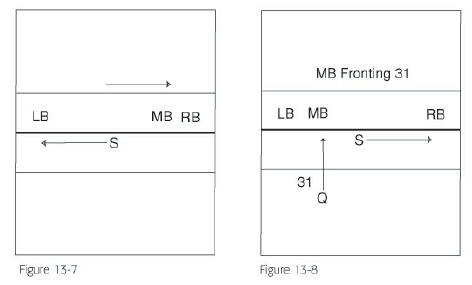 Figure 13-8 shows a middle blocker fronting the quick hitter hitting a 31 set. In this situation, the setter will run the middle hitter on a 31 but set a fast back set to the right-side attacker. Again, this strategy causes problems for the middle blocker because he will have a difficult time establishing a well-formed block at the point of attack. Acommit blocker is one who guesses that the ball will be set quick on a perfect pass and jumps to block the quick hitter without trying to read the setter. Commit blocking creates many one-on-one and, and at times, no-blocker hitting situations. The commit blocker is usually the middle blocker. When the middle blocker is committing, it is a good time to run and to set combination plays. With the middle blocker committing on the quick attacker, the setter brings one of the outside hitters (combination hitters) inside to hit an X-series (X1, X2, X4) play set over or around the middle blocker. Figures 13-9 and 13-10 show the X-series. 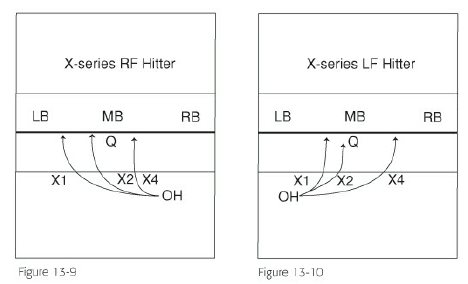 Each figure shows the quick hitter attacking in the center and the outside hitter attacking the X-series play sets. When a team read blocks, the players react to the initial speed and direction of the set ball. Read blocking is one of the toughest skills to master. A good read blocking team is very disciplined; a team with mastery of this skill can make it extremely difficult to score points. Against a read blocking team, the setter should try to set a fast offense and force the middle blocker to move and make decisions. If possible, the setter should establish the quick attacker early in the match so that the middle blocker is forced to protect against the quick attack. This situation is also a great opportunity to run the combination play sets (X-series), but set the quick hitter. What often happens is the blockers will not jump on the quick hitter because they see or hear an outside hitter is moving inside to hit a play set. The combination hitter creates a diversion for the blockers and forces the blockers to make quick decisions. With an experienced setter, it is often difficult for the blockers to distinguish between the quick set and the play set by the initial speed and direction of the ball. Consequently, running the combination play but setting the quick hitter may cause problems for an unsuspecting, read blocking team that is waiting to block the play set. Once the ball is terminated, the setter can look at the blockers to see how they attempted to defend against the offense. The setter will be able to see if the middle blocker committed on or fronted the quick hitter; if the outside blockers are spread or bunched to help out with the quick attack; and if the blockers are switching positions at the last minute to try to hide a weak blocker. In addition to watching the blockers and knowing what type of offense to run, the setter can also jump set to help create one-on-one opportunities for the hitters. Jump setting helps to make the setter more deceptive, and it speeds up the offense. Jump setting is especially effective with an experienced quick hitter who is up early; it can increase the speed of the quick attack and give the blockers less time to react to the set ball. As the experience and the ability level of the setter increases, he must know what to look for and how to run a tactical offense that will create opportunities to give the hitters an advantage against the defense.